This month is a study in what happens when obsessions collide. 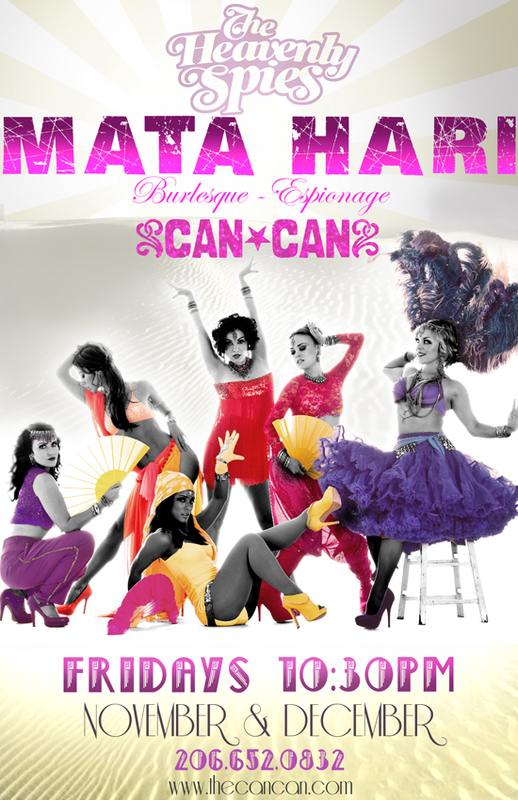 Every weekend in November The Heavenly Spies perform their new run, Mata Hari, at Can Can (Fridays) while The Atomic Bombshells turn it out with a different show each week at the newly renovated Columbia City Theatre (Saturdays). Seattle’s burlesque talent pool is stylistically broad- making this month a perfect opportunity for taking in some classic and modern flair all within the span of a weekend. Or several. Originally Double Oh Sassy (now Sassy DeLure) and I performed with Ultra. I love Ultra- he is to this day one of my favorite performers. We were “Ultra and the Satin Dolls” and we performed at Sonya’s on 1st Avenue. That was in 2003. We didn’t do burlesque at all… actually I don’t think we were even aware of burlesque in Seattle. We were just dancers looking for a new venue and a new way of bringing dance to the masses. If you put sequins on and throw in some jazz hands, modern dance appeals to more people! Anyway, our first show at Can Can was called “The Heavenly Spies”. It was a theme we adopted and then the name just stuck. We started doing burlesque after that first show. We’ve had many incarnations of the group since then- and the style changes with every show. As for the background of the current incarnation of The Heavenly Spies…I studied ballet all my life and as a kiddo performed with the Sacramento Ballet. I graduated from Cornish with BFA in Dance. Kimberly Galore has a BFA in Dance from Western Washington University. Honey Sexpot studied Ballet at British Dance Academy and was trained in the R.A.D. method (Royal Academy of Dance.) She also studied Modern Dance. Coco Capone studied at the Pacific Dance Company and school in Bellingham. ~ by angrytruffle on 11/03/2010.